The main attraction of Siesta Key is the beach! In 2011 it was rated the #1 beach in America by Dr. Beach! It consistently ranks in the top 10 beaches of America, and the water is nearly always pristine and refreshing! The white sand is as soft as could be and also keeps the ground cooler so that you will not burn your feet walking along the miles of shore. There are plenty of Siesta Key Activities, take a day to lay out and tan, splash in the water, or build a sand castle. You can also grab some food, drinks, and snacks from the snack bar under the pavilion located towards the center of the main parking lot. Every Sunday the Siesta Key Drum Circle comes to Siesta Key as well playing from a couple hours before sunset on into the night! Looking for something to do on Siesta Key before returning to Anna Maria Island? Here are a couple of our favorite restaurants and activities to do in the Sarasota area! 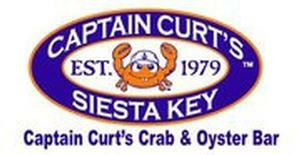 Captain Curt’s features karaoke, delicious food, and live music on select nights!